Wysox, PA – Flynn Propane located in Towanda, PA held its third annual Customer Appreciation Breakfast on Saturday, April 8th at the Wysox Fire Hall. The breakfast which invited Flynn’s customers served close to 300 meals at this years event. The meal was prepared by the volunteer staff of the Wysox Fire Department. 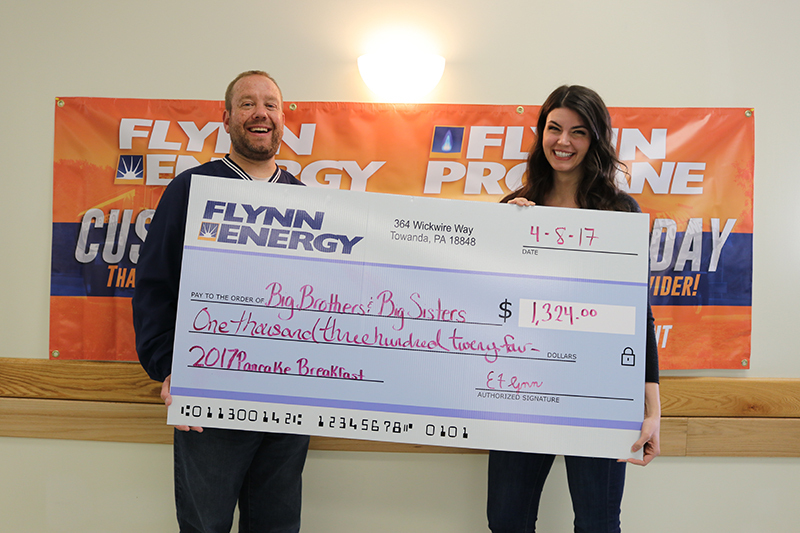 As part of the breakfast Flynn Propane invited Big Brothers Big Sisters of the Twin Tiers, and accepted donations on its behalf. The donations, and 50/50 raised over $1,300. “We would like to give a huge THANK YOU to Flynn Energy & Propane and all of their AMAZING employees and customers!! Thanks to their overwhelming generosity, Big Brothers Big Sisters of the Twin Tiers was the recipient of over $1,300. What a GREAT community to be part of!! !” said Kaitlyn Hoeflin of Big Brothers Big Sisters. In total, Flynn Energy has raised over $95,000 through various charitable endeavors over the past few years. The company has gained a reputation for community involvement by hosting several annual events each year including a charity golf tournament, a Veteran’s Day Celebration and the breakfast. To learn more about our programs, or to become a Flynn Propane customer please contact 570-268-3880 or visit www.flynnpropane.com. If you would like more information about this topic, please contact Ryan Scaife at 570-268-3880 or email at r.scaife@flynnenergy1.com.